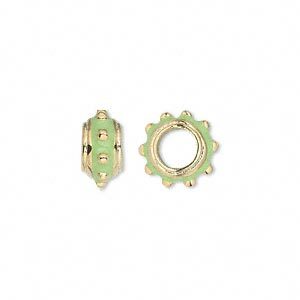 Bead, Dione®, gold-finished "pewter" (zinc-based alloy) and enamel, lime green, 12x6mm beaded rondelle with 5mm hole. Sold individually. Item Number: H20-9981MB Have a question about this item? Large-hole enameled finished "pewter" (zinc-based alloy) rondelle adds bright colors and the look of precious metal at an affordable price. Inside diameter is 5mm. Create personalized beauty with Dione® large-hole beads. According to Greek mythology, Dione (dee-OH-nee) is the mother of Aphrodite, goddess of love and beauty. Bead, Dione®, gold-finished "pewter" (zinc-based alloy) and enamel, pink, 12x6mm beaded rondelle with 5mm hole. Sold individually. 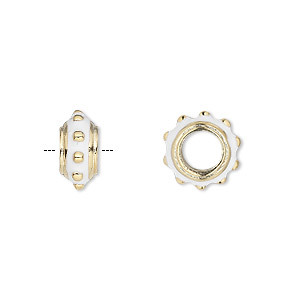 Bead, Dione®, gold-finished "pewter" (zinc-based alloy) and enamel, white, 12x6mm beaded rondelle with 5mm hole. Sold individually. 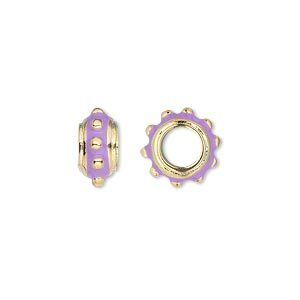 Bead, Dione®, gold-finished "pewter" (zinc-based alloy) and enamel, purple, 12x6mm beaded rondelle with 5mm hole. Sold individually. 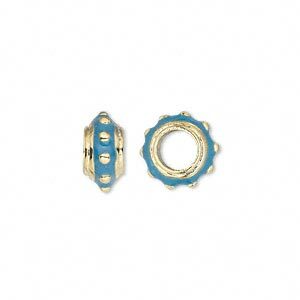 Bead, Dione®, gold-finished "pewter" (zinc-based alloy) and enamel, blue, 12x6mm beaded rondelle with 5mm hole. Sold individually. 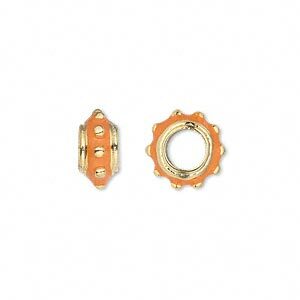 Bead, Dione®, gold-finished "pewter" (zinc-based alloy) and enamel, orange, 12x6mm beaded rondelle with 5mm hole. Sold individually. 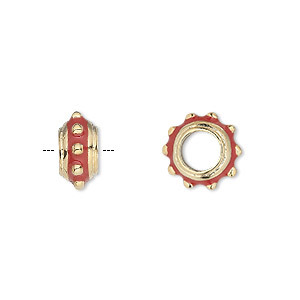 Bead, Dione®, gold-finished "pewter" (zinc-based alloy) and enamel, red, 12x6mm beaded rondelle with 5mm hole. Sold individually. 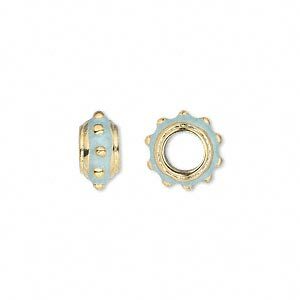 Bead, Dione®, gold-finished "pewter" (zinc-based alloy) and enamel, light blue, 12x6mm beaded rondelle with 5mm hole. Sold individually. Bead, Dione®, gold-finished "pewter" (zinc-based alloy) and enamel, lavender, 12x6mm beaded rondelle with 5mm hole. Sold individually. 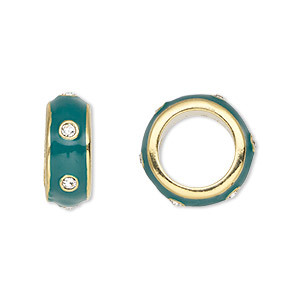 Bead, Dione®, gold-finished "pewter" (zinc-based alloy) and enamel with Swarovski® crystals, green and crystal clear, 14x5.5mm rondelle with 9.5mm hole. Sold individually. 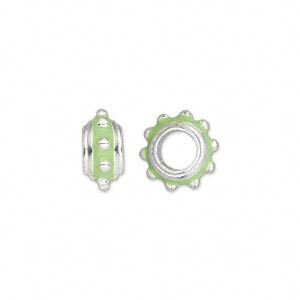 Bead, Dione®, silver-plated "pewter" (zinc-based alloy) and enamel, lime green, 12x6mm beaded rondelle with 5mm hole. Sold individually.